IT organizations are under constant pressure to do more with less. It is no longer simply enough to identify the optimal technology that satisfies the technical requirements. The organization is under scrutiny to identify and justify the technology that best satisfies the requirements of the application at the lowest cost to the business. Not surprisingly, ESG research shows that the most important criteria reported by respondents when it comes to selecting a technology are price and total cost of ownership (TCO). To help balance these requirements from a storage perspective, it is important to identify more cost-effective storage technologies. This requires looking at the price tag of the equipment, examining the efficiencies built into the storage system, and understanding the TCO of the storage investment. 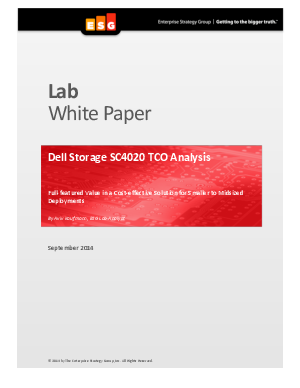 Download this white paper to learn more about how Dell Storage SC4020 can offer full-­featured value in a cost-­effective solution for smaller to mid-sized deployments.